near the sea. The Hermitage also has a spa and a gym. From the small marina you can rent the boats for a trip or do water sports. The hotel also has tennis courts and a golf course. 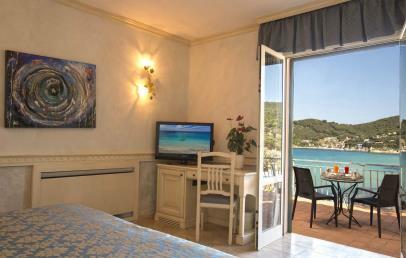 All rooms have been recently refurbished thanks to architect Bönan. 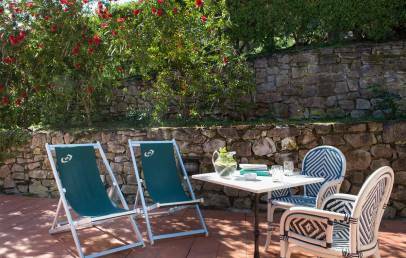 Located on the beautiful sandy bay of Biodola, only 8 km from Portoferraio, the hotel Hermitage enjoys an enviable and exclusive location. Set like a jewel in the green hills and closed on two sides by low cliffs, the hotel is situated directly on one of the most beautiful beaches of the island. Built in the early fifties at the behest of Genoese nobleman Paolo de Ferrari, who, completely enchanted by the beauty of this crystal clear sea and the charm of his nature, decided to build in this part of Tuscan coast, a luxury hotel. This modern structure of the Hotel Hermitage is surrounded by a lush park, full of the colours and the scents that characterise the Mediterranean macchia. Composed of a collection of cottages overlooking the golden beach of Biodola, the hotel comprises a main building where are located the various departments, numerous lounges and a part of the rooms. The other rooms are embedded in the park and enjoy an independent and quiet position. It is a charming hotel renowned for its high service quality, but especially for its great care in meeting all the needs of its guests. Ideal for families as well as for young couples, offers the best vacation for people seeking relaxation and tranquillity but also dynamic sports activities. The Hermitage disposes of 130 rooms located in small cottages surrounded by 50 acres of private park. There are also Junior Suites and suites offering sea view, which are more spacious, feature elegant furnishings and a Jacuzzi. 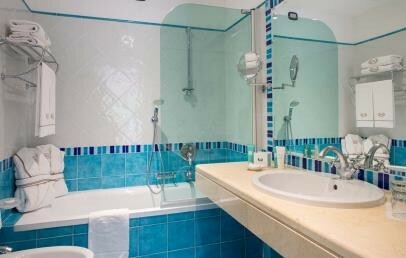 All accommodations are tastefully furnished in Mediterranean style and equipped with modern comforts: complimentary Wi-Fi connection, satellite LCD TV, mini bar, safety box, air conditioning, bath with shower or tub, hair dryer, bathrobes, slippers, courtesy set. The modern aesthetic centre of the hotel arises from the agreement with Intégrée, leader in the field of beauty and wellness treatments. Offers a wide range of treatments: massage with aromatherapy, sauna, sun shower, pressure, and exclusive beauty or healing treatments and relaxing massages for the body. Its professional staff is available to study the possibility of wellness programs customized to satisfy the demands of its guests. Ideal place for pleasant moments of relaxation, where guests can physically and spiritually regenerate. The hotel disposes of three restaurants. the “Hermitage” restaurant that stands out for its refined cuisine based on the traditional Italian dishes and the careful selection of fine Tuscan wines. “Fuoco di Bosco” grill restaurant and pizzeria in the pool that in July and August proposes nice Saturday night dinners with barbecue and live music. 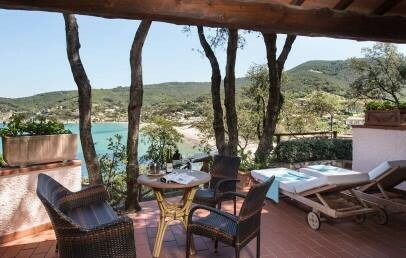 Then there are the “La Ghiotta”, an informal beach restaurant which offers the typical dishes of the island of Elba and the “Peter Pan”, especially created for children (aged 2 to 12 years), with special menus and with particular attention to the entertainment of the young guests. Meals for children 0-2 years are not included in the price of the cot: to pay extra on spot. The Hotel Hermitage offers several facilities: private beach with beach service inclusive of one umbrella and two beds per room, free public parking, Wi-Fi connection throughout the hotel, reception service 24h, hairdresser, gifts/souvenirs shop, a congress centre with 7 meeting rooms (maximum capacity 400 people) and an efficient staff for technical assistance, mini club for children aged 4 to 12 years (from 15.06 to 15.09) and baby-sitting service on request and against payment. The range of sporting activities offered is considerable: 3 swimming pools with seawater, one for children, a 9-hole golf course, 8 clay tennis courts, synthetic soccer field, diving centre with qualified PADI release; water skiing and sailing courses, fitness centre with a wide range of activities including aerobics and customized pilates classes. For walks lovers there is a "path of health," 3-km scenic route that crosses the entire perimeter of the park. It is also equipped with a private pier where it is possible to rent boats for exclusive tours to discover the beauty of the coast. Bright Suites recently refurbished in the main building or in one of the side cottage of the Hotel. The furniture are in the classic Mediterranean style and warm wood colours. 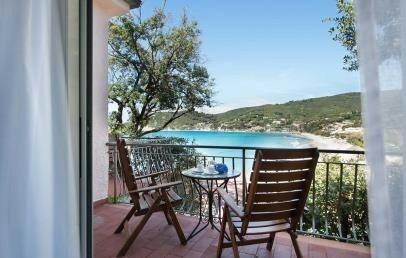 They all have a cosy living room with a sofa and table The bathroom, in fine Italian tiles, has a bathtub with a shower arm, hairdryer, slippers, bathrobe and the “Acqua dell’Elba” courtesy set”. 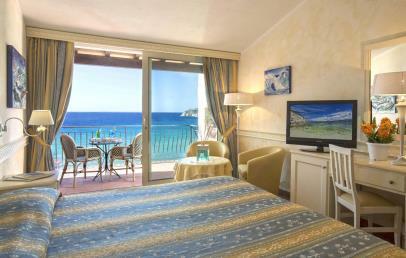 The Junior Suites have a furnished balcony and offer a breathtaking view over the sea and the beach. 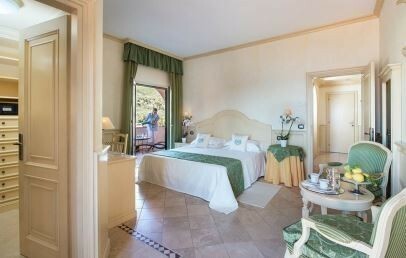 Elegant and large Suite recently refurbished in the main building or in one of the side cottage of the Hotel. The furniture are in the classic Mediterranean style and warm wood colours. 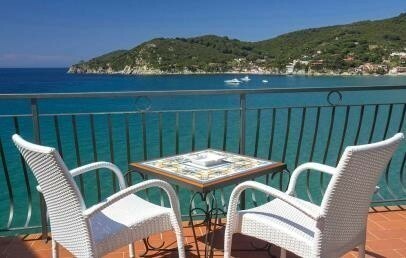 They all have a cosy living room with a sofa and table The bathroom, in fine Italian tiles, has a Jacuzzi, hairdryer, slippers, bathrobe and the “Acqua dell’Elba” courtesy set”. 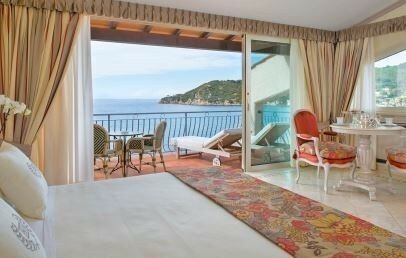 The Suite has a furnished terrace offering a breathtaking view over the sea and the beach. 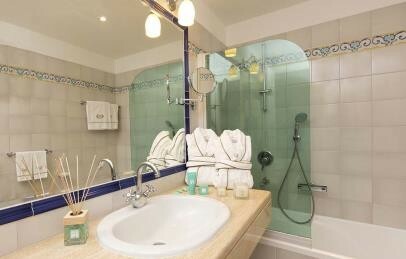 Bright double rooms recently refurbished in the main building or in one of the side cottage of the hotel. The furniture are in the classic Mediterranean style and warm wood colours. 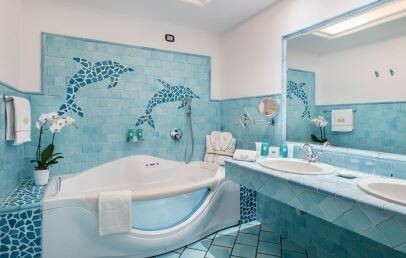 The bathroom, in fine Italian tiles, has a bathtub with a shower arm, hairdryer, slippers, bathrobe and the “Acqua dell’Elba” courtesy set. 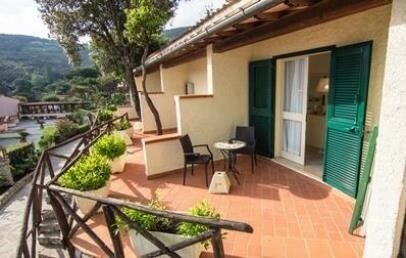 Classic rooms have a furnished balcony with chairs, a little table and garden view. Simple and comfortable rooms. They are oriented towards the well-kept garden of the hotel or in direction of the Bay of Biodola. They have air conditioning, mini bar, safety-box, complimentary Wi-Fi connection, satellite TV flat screen. 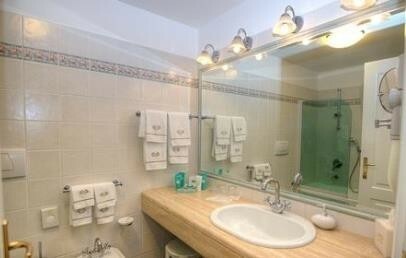 The bathroom has shower or tub, hairdryer, slippers, toiletries. The rooms have a balcony or terrace. A suitable accommodation for families with two separate bedrooms. 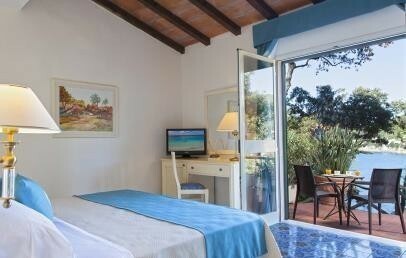 It offers the main bedroom with double bed and another small room with two beds for children. The decor is simple and comfortable. They are oriented either to the hotel's well-kept garden or to the bay of Biodola. They are equipped with air conditioning, mini bar, safety-box, complimentary Wi-Fi connection, flat screen satellite TV. 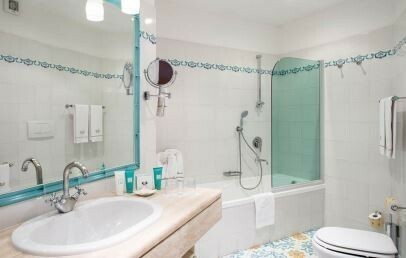 The bathroom has shower or tub, hairdryer, slippers, toiletries. The rooms have a balcony or terrace. Early Booking - Book within April 30th 2019 and get a 10% reduction on your stay (stays from April 26th to June 30th)! Early Booking - Book within June 30th 2019 and get a 10% reduction on your stay (stays from September 15th to October 5th)!